California experiences a super bloom. Scientists create a particle robot. And researchers play music to cheese! Parts of southern California, in the United States, recently burst into colour thanks to a phenomenon known as a “super bloom”. A super bloom happens when normally dry, desert areas get lots of rain in the autumn and winter. This causes seeds that are dormant – meaning alive, but not growing – to sprout and bloom. This time, there are so many bright wildflowers, the bloom is even visible from space! 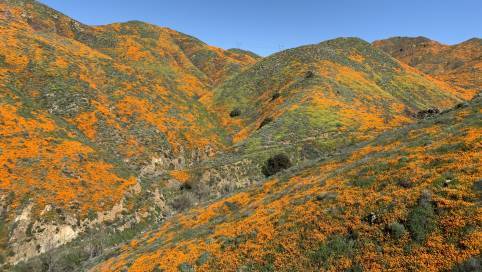 This photo was taken by a satellite, and it shows hills covered in bright orange California poppies. The last super bloom was in 2017, but this year’s is even bigger and brighter. Next up… it’s Tech Beat. A robot is usually a system of different parts that rely on each other. If one part breaks, the whole robot stops working. Now, scientists in the United States have created a new kind of robot which can keep moving, even if one part breaks. It’s made up of pieces the scientists call “particles”. On their own, the particles can’t do much – just expand and contract. But when several particles are joined together with magnets, and expand and contract in turn, they can move as a group! For now, the robot can only carry out basic tasks, like pushing objects and getting around obstacles. But the scientists think this approach could eventually create robots that can grow and change shape to perform more complex tasks. Uh, no… neither have we! However, researchers in Burgdorf, Switzerland, did ask themselves that question. They took eight wheels of the same kind of cheese and played each one either a sound wave, or a genre of music – including rock, classical and hip hop. Several months later, a group of food experts tasted the cheeses. The cheese that was played hip hop tasted stronger and fruitier than the others! The researchers think this could be because vibrations from the music affect the ripening process that gives cheese its flavour. So what kind of music do you think would make the tastiest cheese?! That’s all for this week. We’ll see you next time. Parts of southern California have experienced a super bloom, which occurs when heavy rainfall in normally dry areas causes dormant seeds to sprout and flower. Scientists in the United States have created a new kind of robot which consists of several expanding and contracting “particles”. Researchers in Switzerland have found that playing hip hop to cheese makes it taste stronger than cheese that’s played other kinds of music. Why do super blooms happen after heavy rain? Super blooms normally occur around once every 10 years. Why do you think they don’t happen every year? Apart from looking beautiful, what other effects do you think the super bloom might have on the local area? What makes the particle robot different to other kinds of robots? The scientists who created the particle robot were inspired by cells – the building blocks that make up all living things, including you! What similarities do you think there could be between the "particles" and cells? Why might it be useful for robots to have the ability to grow and change shape? The researchers left one cheese in silence while the others were exposed to sound waves or music. Why do you think they did that? One researcher said the experiment is more of an art project than a scientific study. What do you think? If you could do an experiment involving music, food or both, what would it be? Use these resources to get the most out of the news update and engage your class in topical science! This simple guide helps your students to create their very own science news updates.